Great for lunch time! Suitable for vegetarians.Halfway through the day and need a tasty pick-me-up? 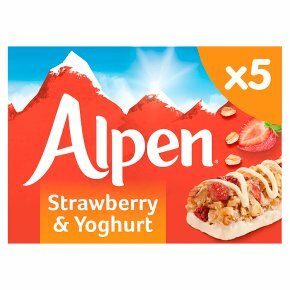 Every Alpen bar is cram packed with an abundance of delicious ingredients. Juicy strawberries, creamy rolled oats and crunchy wholegrain wheat flakes dipped and drizzled with a delicious yogurt flavour coating! Hits the spot everytime!